A good chunk of Adventureland is dedicated to Pirates of the Caribbean. 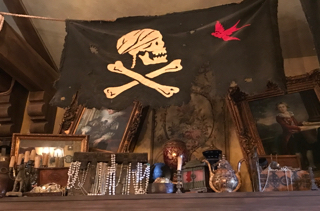 Of course there is the classic attraction, but there is also a show, a scavenger hunt, a restaurant, and a great "makeover" salon called Pirates League. The details throughout this location are plentiful. I took this shot of an upper shelf on Monday, while two of my tour guests were getting makeovers.